Country Music People – CD REVIEW! Visit the NPR Site to hear this interview and select songs from Countrypolitan Duets. Patsy Cline probably never imagined that "Walkin' After Midnight" could sound quite like it does on a new CD called Countrypolitan Duets. Jazz singer Anna Wilson, working in collaboration with country group Lady Antebellum, twists Cline's original from a bouncy country ballad into a full-throated swing number. Wilson has brought together an A-list roster of other country music performers to reinterpret classic songs with a touch of jazz. 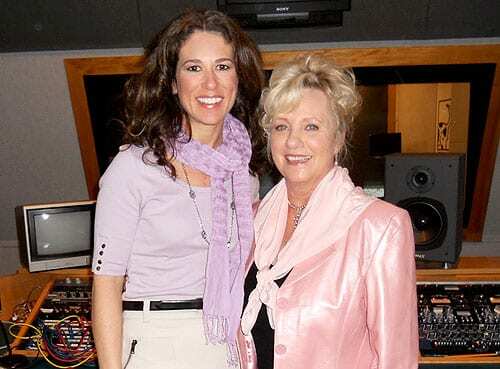 Jazz chanteuse Anna Wilson and country singer Connie Smith pictured at Spotlight Studios in Nashville where they taped NPR’s Weekend Edition, scheduled to air this weekend. Smith appears on Wilson’s new album Countrypolitan Duets, produced by Wilson’s husband Monty Powell. Guests on the project which was released this week include Keith Urban, Lady Antebellum, Rascal Flatts, Kenny Rogers, Ray Price, and Billy Dean. The album offers country standards like Patsy Cline’s “Walkin’ After Midnight,” Price’s “You’re The Best Thing That Ever Happened To Me” recorded with jazz flair. CANADA AM – ANNA Performs Duet with Matt Dusk!